In 1995 Robert Schifferle founded “Rafting Sterzing” which developed into a leading Italian rafting company over the years. Not only is the rafting team of Sterzing known worldwide for its successful competitions but also for its well trained rafting guides. Since 1999 to 2017 the team is ininterrupted Italian Champion overall. The members of the team R4 2018 are captain Robert Schifferle, Patrick Agostini, Alex Zanella, Amadeus Schifferle and from Meran Thomas Waldner. For the first time this year junior athlets from SV Sterzing will join the R6 team. Since the Italian Rafting Federation resigned from the International Rafting Federation in January 2018, participation on international events organized by the IRF will no longer be possible. From now on our athlets will partecipate on races organized by the new World Rafting Federation. Italian champion R4 overall with Robert Schifferle, Waldner Thomas, Patrick Agostini, Alex Zanella and Deutsch Matthias. Italian champion R6 overall with Robert Schifferle, Waldner Thomas, Patrick Agostini, Alex Zanella, Alex Kaser and Volgger Johann. Italian champion overall R4 with Robert Schifferle, Alex Kaser, Waldner Thomas, Luca Daprà, Patrick Agostini and Alex Zanella. 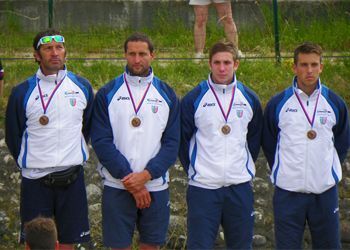 Bronce medall in Sprint and Downriver R4 at the European Championship in Bratislawa with Robert Schifferle, Waldner Thomas, Patrick Agostini and Alex Zanella. Italian champion overall R4 with Robert Schifferle, Amadeus Schifferle, Alex Kaser, Alex Zanella and Patrick Agostini. Daprà Luca and Waldner Thomas. Silver and bronce medall for our U23 team in H2H and Down River and 4th overall at rafting world championship in Newzeeland 2013, with: Patrick Agostini, Alex Zanella, Luca Daprà, Daniel Klotzner and Matthias Deutsch. R4 with Robert Schifferle, Amadeus Schifferle, Alex Kaser, Alex Zanella and Patrick Agostini. R6 with Robert Schifferle, Kaser Alex, Thomas Waldner, Luca Daprà, Daniel Klotzner, Matthias Deutsch, Alex Zanella and Patrick Agostini. 2 silber medaills and 2 bronce medaills at the World Junior Championship in R4 at Cechia.